Quayside Plaza01493 331777work Restaurant - Contemporary EuropeanQuayside Plaza in Great Yarmouth is situated on the historic South Quay between the Elizabethan and Nelson Museum. A popular, unique and friendly restaurant with a chillout atmosphere. 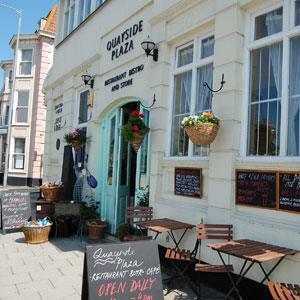 We serve delicious home-made cakes, soups, local smoked fish, and daily specials based on a mediterranean cuisine. Every second and last Saturday of the month we create a special evening to remember with theme nights that include live music and entertainment. Sunday to Wednesday from; 09:00 till 16:00. Thursday, Friday & Saturday from; 09:00 till 22:00. In addition we host theme nights with live music on Fridays and Saturdays. Please check opening times over festive period. 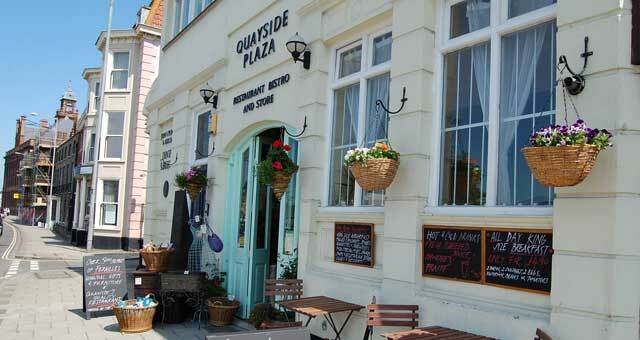 Tucked between the Elizabethan & Nelson museums on south quay riverside of Great Yarmouth. 100 metres from the market place at the rear - greyfriars parking or along the quay.